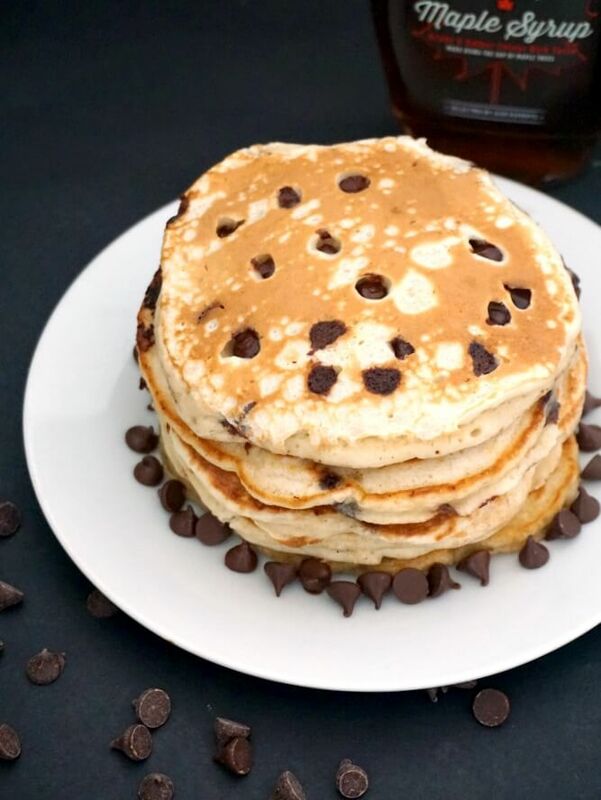 Banana Chocolate Chip Pancakes, the ideal indulgent breakfast or brunch. Fluffy, super easy to make, and ready in about 15 minutes or less, these pancakes are not to be missed. A real treat for the whole family on Pancake Day. 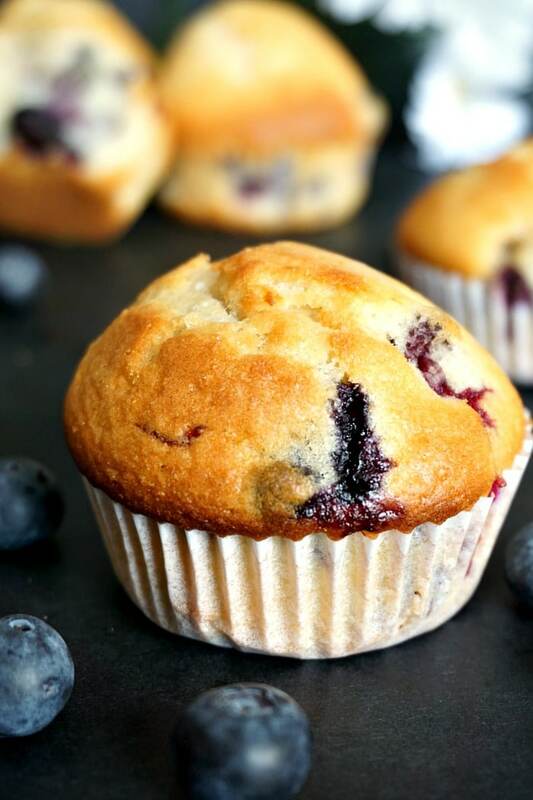 Don’t you just love mornings when you get to indulge? I can’t think of a better way to start your day than with a deliciously fluffy homemade pancake and a nice cup of tea or coffee. And if chocolate chips come into discussion, you know it can only be great. I mean, since these pancakes have no added sugar at all, the chocolate chips are the only naughty stuff in here. But not too naughty though. If you choose dark chocolate chips, it can’t be that bad. Plus, it’s Pancake Day, so you can make your pancakes as indulgent or guilt-free as you want. You only get one Pancake Day a year. Or every weekend, if you are like me and love a good batch of pancakes. 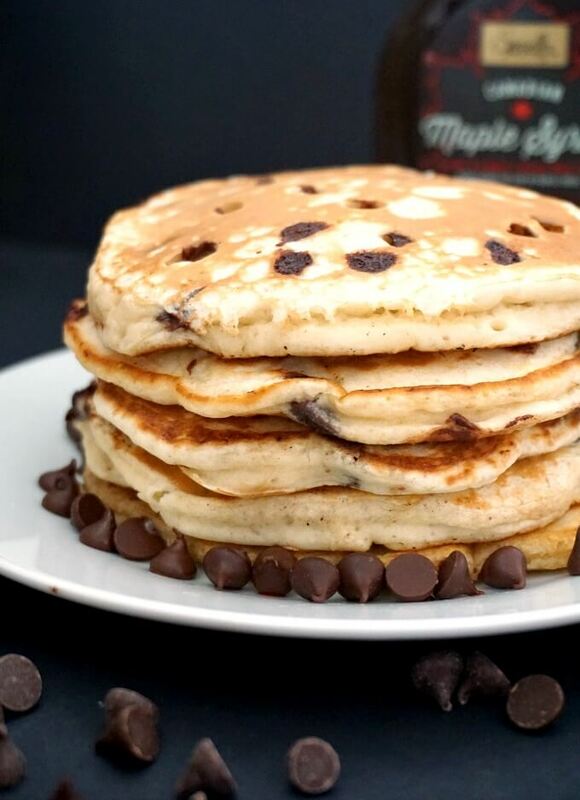 How do you make the best banana chocolate chip pancakes? Right, l need to tell you a trick about making fluffy pancakes every single time: BAKING POWDER. You must use it, and you get the best pancakes in the world. Without baking powder the pancakes tend to be rather dense and rubbery. Even if you use self-raising flour, still add the baking powder, you will see the difference. In a bowl, sift the flour, add the baking powder, and mix well. Use a fork to mash the banana, add at it to the bowl too. Beat the egg well, add it to the milk together with the vanilla extract, and pour it over the flour. Add half the amount of chocolate chips, and stir well to get a smooth batter. Heat up a pan, add a drizzle of oil or butter, add half a laddleful of batter, and top with more chocolate chips. Eeven the batter starts to form tiny bubbles, flip it over, and leave to cook for a further 30 seconds to one minute. I have another super fluffy recipe for pancakes, my Fluffy American Pancakes. Worth a try, they are equally delicious, and the secret with that recipe is beating the egg whites until they hold stiff peaks. I wouldn’t say it takes much longer to make than this banana chocolate chip recipe, it’s jusst a different technique. 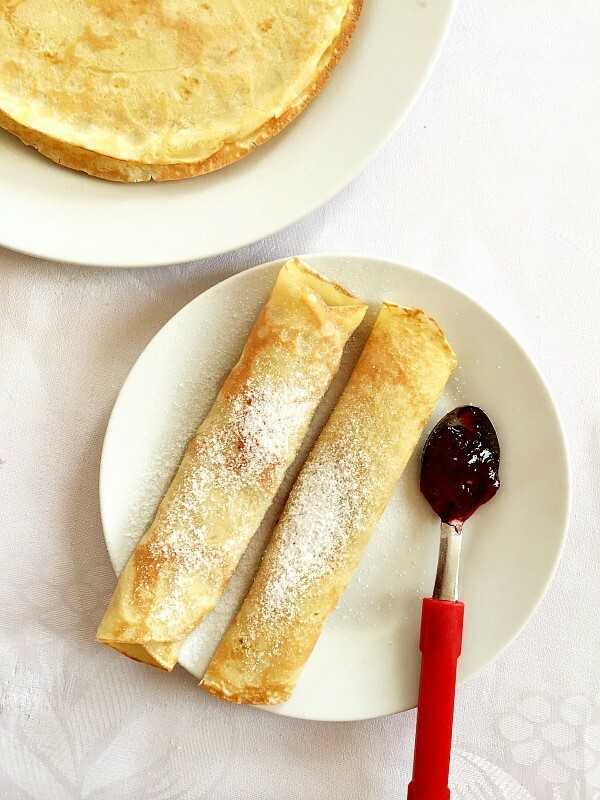 If you want to try an authentic crepe recipe, these Perfect French crêpes are the only recipe you’ll ever need. Serve them with anything you like: maple syrup, honey, jam, peanut putter, anything goes. With either pancakes or crepes, the heat has to be a low to medium, as they cook quickly, and you don’t want to burn them. No need to use a lot of butter or oil, just a small drop would do, especially if you pan is a non-stick one. And there you have, some lovely pancakes to make your mornings sweeter. Or any other time of the day, they make a nice dessert too. If you’ve tried my BANANA CHOCOLATE CHIP PANCAKES or any other recipe on the blog then don’t forget to rate the recipe and let me know how you got on in the comments below, I love hearing from you! You can also FOLLOW ME on FACEBOOK, INSTAGRAM and PINTEREST to see more delicious food and what I’m getting up to. 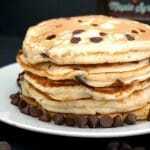 Banana Chocolate Chip Pancakes, a real treat for the whole family on Pancake Day. Beat the egg lightly, then add it to the milk together with the vanilla extract. Add the milk mixture and mashed banana to the flour, and mix to get a smooth batter. Add half of the amount of chocolate chips to the batter, and mix well. 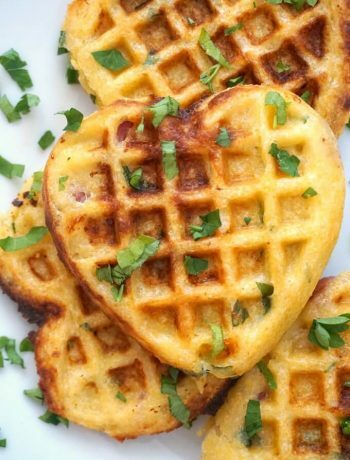 Heat up a frying pan, add a bit of butter, then add half a laddleful of batter to the pan. 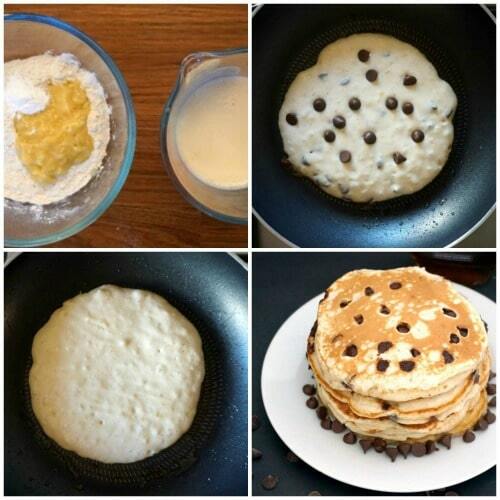 Sprinkle some chocolate chips over the pancake before flipping it to the other side to cook. Repeat with the remaining batter, there should be about 5 pancakes, depending how big the pancakes are.